I tried to make this shorter, and yes I know this looks more like a synopsis than a review but it’s not detailed enough to be a synopsis and too detailed to be a review so lets call it a conversation (with myself obviously) If you just want to read the highlights then read the bold quotes and scroll down the 10000 pages to get to the principles of unconditional parenting. If you want to read my musings then sit comfortably, get something to eat and enjoy! I started reading this book as part of my course work for my coaching certificate. While I was reading it I felt like it was uncovering exactly what that nagging feeling inside me is. I started to understand how conflicted I feel with certain aspects of my parenting. The author explains the importance of loving children for who they are (unconditional) as opposed to loving them for what they do (conditional). He asks us to always put our relationship above our children’s behaviours. Kohn also talks about ‘withholding love’ . In the second chapter he discusses Time-Outs and explains how he regards this form of discipline as a version of love withdrawal. I have read many articles that state the same and when you think about it, when a child acts out it is because needs have not been met. There is always something the child is lacking that triggered the behaviour. And when you think about what the child is going through when he is exhibiting this behaviour is it probably not very pleasant. So sending your child away at the time he feels the most out of control teaches him that when he is at his worst and feeling his lowest you will not be there for him. He has to sort it out on his own. Alfie Kohn also explains that by giving them time out or sending them to their room we effectively are making them live their biggest fear or abandonment. And although you still love your child even when he is misbehaving, the younger the child is the more likely he will feel you only love him when he’s ‘good. I used to use time outs on the older two. Then I changed my tactic to one of asking the child who is misbehaving or having a tantrum to “leave the room and come back when you have calmed down” . Or “crying is not allowed here, when you have calmed down you can come back” According to Kohn this is the same as Time Outs. I feel it is a less judgmental way of dealing with the situation while still showing your child that how he is behaving is not acceptable. I hold my children up to the same standards I hold myself up to while still taking into account their capabilities and their ages. The second part of that quote is the one that truly got me. When I take away the iPad for example from my 6 year old for hitting the focus for him would be on how his actions effected his happiness. I doubt he will be thinking about how he hurt the person he hit. In fact it will probably breed resentment towards that person because they are the reason his happiness was taken away from him. Kohn goes on to talk about rewards. and how they in turn make the focus the reward as apart to the task they dot the reward for. I used to use the marble jar system with my kids an I swore by it. But there was something materialistic and superficial about the behaviours they exhibited to gain a marble. They started saying things like “I’m sharing! Can I have a marble” and “I helped him up after he fell! can I have a marble?”. These were things they shouldn’t expect monetary rewards for and because of my system expected to get one! The studies he lists throughout the book reveal how ineffective, and sometimes detrimental, the parenting strategies we use such as rewards, punishment, positive reinforcement and others are on children and their ability to achieve their goals. “Positive reinforcement exemplifies idea of conditional parenting” this is the mirror image of love withdrawal. Instead of taking away love when he does something wrong this is giving love when he does something right. Tying your love or praise or approval with only actions you approve of. Too much positive reinforcement be to children putting a lot of pressure on them to keep up the good work and making them less inclined to take chances or explore new pathways in fear of failing. Many times in this book I feel like Kohn goes a bit too black and white in some areas, dismissing any good at all that can come from certain wide spread behaviours use by parents. Yes I am guilty of dolling out the “good job” for ridiculous things on occasion, and I agree that children often look to their parents for their dose of approval once they have done something ‘good’ but I think, when it is balanced, it is important that the child see how happy we are for him for his achievement. It’s more important how we act when they fail in my opinion. Kohn says at one point that we don’t act in the same way when they fail as we do when they succeed so that proves that we are being conditional with our approval. I think it’s important they know they are loved either way and that that comes down to the big picture but in life no one will celebrate their failures as they do their successes so it’s illogical to say that therefore you can’t celebrate their achievements or you have to celebrate just as much when they fail. Be accepting no matter what and supportive no matter what but in my opinion when they have done something worth celebrating then celebrate! Kohn talks about how we control our children in a way that shows complete disrespect to them. Out of all of the chapters this is one that hit home the most. I used to always repeat the mantra that “I am not my child’s friend, I am their parent”. after reading this chapter I thought about why that is exactly. What was it I was afraid of “being their friend” doing? I wholeheartedly believe in this last quote. Exerting absolute control over a child results in either excessively compliant or excessively defiant children. Do we really want either? At the beginning of the book Kohn asked us to list what our goals for our children are and see if how we are raising our children aligns with those goals. One of mine was for them to be independent, confident adults who can make their own decisions. Something has to change… Because making them feel powerless because I am ‘the mother’ and I always ‘know better’ does nothing for their self worth and their confidence. I do not mean by this that I will not guide them, correct them when needed and hold them up to the same standards I hold myself up to. This just means that I can do this without belittling them, making them feel incompetent or breaking them. How would you react if a child forgot something that belonged to them at home. Now think about how you would react to a friend or colleague who did the same? Honestly answer that question and see if you are giving your child the respect every human being deserves. I would add to this that it is our rolls as parents to teach them the tools to not forget their things at home if they are forgetful. Then hold them accountable, respectfully, for doing that. Now for the part that caused the liveliest discussion during our book club meeting. ; Punishment. I think this is again an area where he went a bit too black and white in my opinion. I agree with him on the point that punishing a child makes the child focus more on how their actions affect themselves then on how their actions affect others. It’s almost guaranteed that the child will be thinking ‘i shouldn’t hit again so I don’t lose my iPad privileges’ than ‘I shouldn’t hit because it hurts others’. I could not find an answer to how to deal with two children (lets say, just for example, a 3 and a half year old and a child who’s turning 6 in a month) are on the floor having a full blown fight because the 3 year old kicked the 6 year old to get the football.. Yes I know I need to look at the whole situation and why it has happened and try and see the bigger picture but talking to a 3 year old then letting him go back to playing may eventually work (I only was able to try it for a short time till I ended up with a child who was licking salt off the floor of a restaurant) before I became all together controlling (grabbing him of the floor and picking him up against his will) and inflicting punishment (Taking him home because he was licking salt off the floor for Gods sake!) I couldn’t stop that with non violent, respectful communication with my toddler. Another area I wasn’t 100% convinced of was natural consequences. The way he describes it is different from what I understand it to be. For me a natural consequence is when my child fro example forgets about a project till bed time he will have to go into school without having done it. I cannot save my child out of every situation they are in, at some point they have to save themselves. And seeing first hand the consequences of not being organised and doing work on time is the best way to remember that. Yes I should teach them how to be organised and I can remind them to do their homework but theres a limit to how much I can help. I do believe that the most important element to never lose in any interaction with your child is respect and unconditional love. Think about the way you are speaking to them, the words you are using, your tone of voice and even body language. The consequence of the mistake (and if you chose to punish them for it) is enough without you adding to it by holding back love with the way you are doling it out. The most interesting information for me in this part is that children who’s goals are to get high grades often shy away from challenging projects and try and tick instead with what they know. Trying something new or exploring different options is not an option for someone who wants the sure fire A. And that’s not the kind of child I want to raise. I would rather my child get a lower grade for trying something new then an A for doing the same thing he always did. 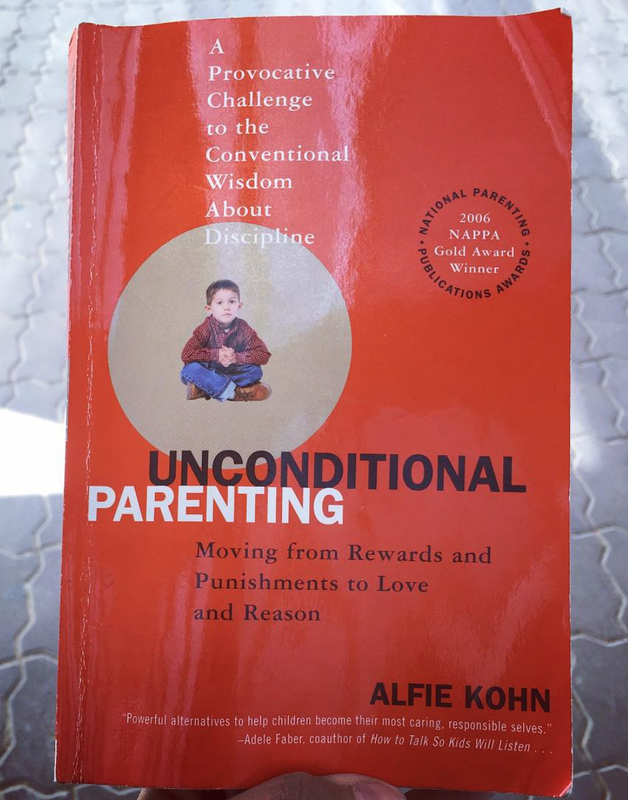 Kohn finishes up with the principles of unconditional parenting. • Be reflective “The best parents are introspective and willing to give themselves a hard time.” Sometimes the qualities that most irritate parents about their children turn out to be unwelcome reminders of their own least appealing features. Be honest with yourself about your motives, don’t stop being troubled by the things you do that are troubling. And be conscious of how you are interacting with your child. • Reconsider your Requests Think about what it is you are asking your child to do. Is your child capable of doing it? (Toddler sitting in a restaurant quietly for an entire meal). Are you bribing your child to get something done? • Keep your eye on the long term goal Think about what it is you want for your child in the long term (to be happy, independent, self fulfilled etc) and see if certain parenting strategies may actually be impeding the realisation of your goals for your children. • Put the Relationship First What matters more than asserting your control and being right is how your child feels about you.
. What matters most is the mutual respect and affection shared between you. Does your child feel safe to express his emotions even if they differ from you? How do you react to your child expressing their emotions when they are not what you expect them to be? • The Love has to be Unconditional Any expectation that your child needs to earn your love (smile, hug, affection, caring, attention) is love withdrawal. Children need to know they are loved, most importantly that they are loved when they make mistakes. They need to know you are on their side and are cheering for them to do well and encouraging them to fix their mistakes not waiting for them to make them. Conditional love is also when you tie your love to a reward. Too much positive reinforcements makes your child a praise junkie, It is no longer about what he accomplished but rather about the attention you give him when he has accomplished something. • Be Authentic Be real with your child. Do not pretend to be this unflappable person that they can never live up to. Or even worse that they figure out is wrong but never admits it. Don’t be afraid to apologise to your child. • Imagine how kids see Things Truly putting yourself in the childs place helps understand how things can be overwhelming, exhausting and frustrating for your child. Try not to forget the limitations children have that come with their age and size and for older children the demands they have on them by school and out of school activities. in short, empathise. • Talk less, Ask more As parents we tend to talk to (or at) more than listen to our children. Try and ask more questions and wait and listen for answers. • Assume the Best “Find the best possible motives consistent with the facts”. Children do not set out to make you unhappy or to defy you. Children will always act according to our expectations. Expect them to be good and they will be. Expect them to be bad and they will be. • Try to say Yes, when you can Do not make no your default answer. sometimes as parents we tend to say no because children need boundaries and they need to know life doesn’t always go as they want it to. Making our children unhappy when it is avoidable doesn’t make them better at coping with unhappiness when they grow up. Think twice before saying no. Try and say yes to as many requests as you can. Ask yourself why are you saying no in the first place? Saying yes as often as possible makes your no’s more effective. • Don’t be Rigid Don’t be afraid to change your mind or even change the rules sometimes. Having a united front for the sake of a united front doesn’t make sense to a child. It just seems like you are ganging up on them. Be honest and teach your child life is about compromise and disagreeing with other is normal. Show them the healthy way to have a disagreement. • Let kids decide whenever possible Our children go through life being told what to do, when to do it and how to do it. Try and give them a choice in decisions that affect their lives as much as possible. Within reason! You won’t let your child choose his school but you can let them choose their outfit for the day! only give them choices you are willing to follow. Do not give them fake choices. I am still on the fence about this book. I think like everything else in life I can take what sits well with me and works well with me and leave what isn’t behind. I feel Kohn is too submissive to his children and while he feels he has a mutually respectful relationship with his children I feel that children need from us to also be strong, to be a guide and to learn from us what is acceptable and unacceptable behaviour. The world will not be as kind and understanding as he is asking us to be. And I do agree with him that it doesn’t make sense to try and make their life hard because life is going to be hard. But equally it doesn’t make sense to take it upon ourselves to shelter them from any hardship at all even when it is a result of them doing something wrong. I have consciously changed the way I speak to my children and I do admit I did not give their opinions and feelings a lot of respect before reading this book. But I do think it is part of my job to correct them. I would love to hear your thoughts on this book or other Alfie Kohn books. Next What Would Mama Do?